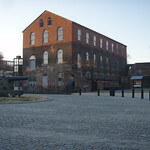 The American Civil War Center at Historic Tredegar is the nation's first museum to interpret the Civil War from Union, Confederate, and African American perspectives. This museums mission is to tell the entire story of the conflict that shaped the nation. The museum regularly hosts lectures, education programs, conferences and symposia, and other public programs. $8 Adults; $6 Seniors (age 65+); $4 Groups (25 or more); $2 Children (age 6+); FREE Children age 6 and under.